The boroughs in Copenhagen are very different, as you may have already noticed. There’s hip Vesterbro, multicultural Nørrebro – and there’s Østerbro. Locally it is known for café latte moms with baby strollers and spelt bakeries. 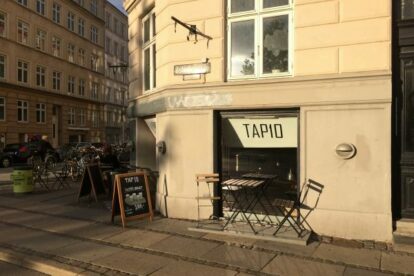 But Østerbro has much more and Tap 10 is one of the little pearls here. They have – as the name might suggest – 10 unique brews on tap, ranging from light to pitch black in color and taste. When you need somewhere to hide, it’s just down the few steps and inside this little comfy bar. The whole place is furnished by odd, old furniture, which just adds to the mood of this place. But of you want to soak up the early spring sun, there are seats outside in the westward direction. This means you can catch the last sunbeams before you call it a day, or go into town for a night out. And don’t you worry! If you can’t pick which beer to try, you can have a tasting board of 5 different beers for 100 DKK. Bring a friend – try them all! I enjoy going here and playing backgammon, with a black ale in hand. Oh, and they have yummy cocktails as well, if you don’t want to get your brew on.